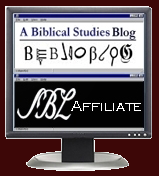 Biblical Studies and Technological Tools: Biblioblogger of the Month! Well, my teenage daughters aren't bragging about it to anyone, but I am honored to report that I am "Biblioblogger of the Month" of December. Thanks to Brandon Wason for giving me the opportunity to be interviewed. You should note the theme of appreciation for the teachers I have had along the way. I am thankful for them and thankful that I have the opportunity to be teaching now myself.